Welcome to the Church of the Reconciliation! Comfort in times of trouble, celebration in times of joy, belonging in times of loneliness . . . Thank you for visiting our website. Whether you are unhappy with your present church, whether you have been away from church for a while, or whether you are frustrated and confused as to how best to manage your life in this secular world, we pray our church will provide you with the spiritual home you may be searching for. Many people today long for a spiritual home which will provide a place to worship, a sense of belonging and fellowship, and an opportunity to learn and grow in their faith. That is exactly what we work to accomplish at the Church of the Reconciliation. We are a faith community of all ages and all walks of life that comes together to spread the Gospel by word and example, and to provide support and encouragement to those inside and outside our walls. We are dedicated to mission and outreach in our town, our nation, and our world. About our faith . . . 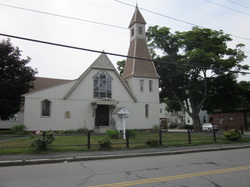 The Church of the Reconciliation is an Episcopal Church, established in the town of Webster, MA almost 150 years ago. We are a Christian church which honors as the three basic sources of our faith: the Holy Scriptures, human reason, and Church traditions. We are an apostolic faith, meaning that we trace the ordination of our bishops back to the apostles and the early Church. We are a sacramental faith, meaning that we believe in baptism and the Holy Eucharist as established by Jesus, to provide outward signs of an inward grace. We believe that the Bread and Wine, consecrated during the service of Holy Eucharist (the Mass), contains the true presence of Christ. Our Orders of Ordained Ministry (clergy) include bishops, priests, and deacons. Both men and women may be ordained, and married clergy with children is commonplace. The Episcopal Church in the United States was established after the Revolutionary War. 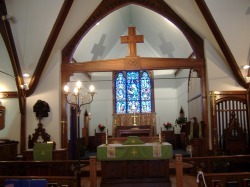 It grew out of the Anglican Church in Europe, which was established in the early 1600s (the Protestant Reformation) and brought to America during colonial times. The Anglican Church broke away from the Roman Catholic Church at that time, but we still maintain many of the same aspects of liturgy and religious tradition from our Roman Catholic roots. The Episcopal faith encourages us to make our own interpretation of the Bible, guided by the Holy Spirit, and the traditions of the Church. With a few exceptions, found in the Nicene Creed, we are not told what to believe. The Book of Common Prayer is the foundation of how we pray, and contains all the liturgical services we use. We follow a very democratic form of church government on national, diocesan, and parish levels. There is no Pope or one leader who makes the rules. Church decisions are made with input from bishops, priests, and the people of the church. We pray you will join us . . .
We would love to have you join us as part of our faith community. If you would like to talk with me in more detail, please call 508-330-8073 to set up an appointment. I can also be reached by email at pastor@reconciliationweb.org. We believe that God has led you to us today, and we pray that you will continue to be with us in the days to come. Click here to listen to Pastor Janice's Easter Sunday sermon. Join us on Sunday, May 5th at 10:00 a.m. when we celebrate the 150th Anniversary of our parish. Our guest concelebrant and preacher will be the Rt. Rev. Gordon P. Scruton, 8th Bishop of the Diocese of Western MA. Opening the Word Peer Recovery Center, at 10 Mechanic Street in Webster is open Monday thru Friday from 9:00 a.m. to 3:00 p.m. Peer recovery coaching is available. We offer an All Recovery Meeting on Mondays from 1-2 pm. Tuesdays from 7:00-8:00 p.m. is our Recovery Bible Study. Wednesdays from 11 a.m. to noon is our Woman to Woman meeting, our support group for family members of those living with addiction meets on Thursday evenings from 7:00 pm to 8:00 pm, and Gamblers Anonymous meets on Saturdays from 9:30 to 11:00 a.m. Please take advantage of this great resource in our town. We are here for YOU! Everyone is welcome! AA meets everyday @ 7:00 a.m. in the parish hall. ALANON meets on Monday evenings @ 7:30. 10:00 am Service of Holy Eucharist-Rite II year round.